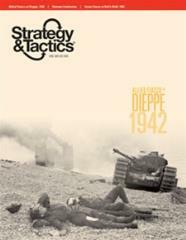 Operation Jubilee: Dieppe, August 1942 (OJ), designed by John Butterfield, is a purpose-designed solitaire wargame of intermediate complexity simulating the disastrous Commonwealth raid against the German-held French port of Dieppe on 19 August 1942. A mixed force of Canadian troops and tanks and British commandos landed on several beaches along a 16 mile stretch of coast, with a variety of objectives. While the commando raids on the flanks met with some success, the major action against Dieppe was a costly failure. It didn’t come close to achieving its objectives, and over 75 percent of that landing force were killed or captured. In play, you control the Commonwealth forces assaulting the beaches and struggling to achieve their objectives against intense German resistance. The game system controls the German forces that oppose you. Each hex represents 400 meters (438 yards) across. Units of maneuver are platoons and companies. Each game turn represents 20 minutes. Special rules cover such things as: amphibious operations, coast battery fire, transport, evacuation, command control and communication, German unit mobilization and depth, heavy weapons, engineers, tank barriers, aerial attack, targeting, disruption, infiltration, flanking, tactical prowess, surrender, fire priorities, optional historical variant set ups, and more.